The family friendly Maldivian island of Bandos has been a recurrent theme in Zac’s diving progress and would be again in the future. 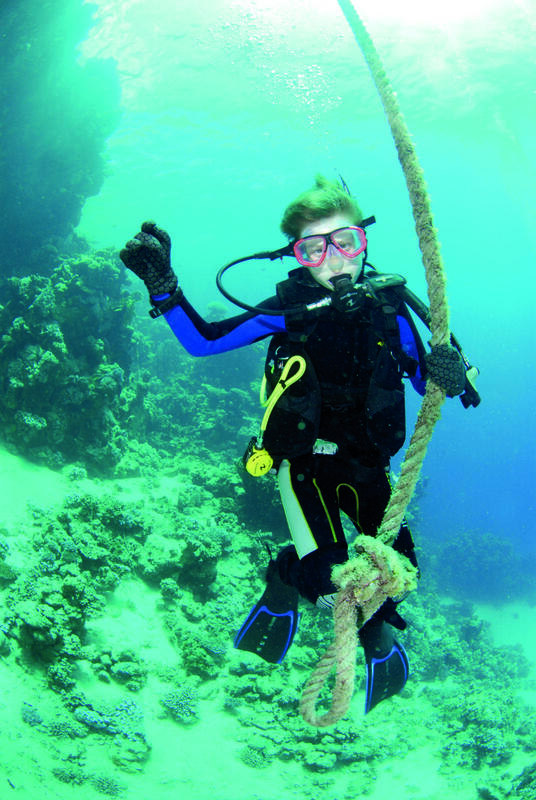 Now, armed with his PADI Junior Open Water certification, he could begin experiencing dives beyond the house reef. 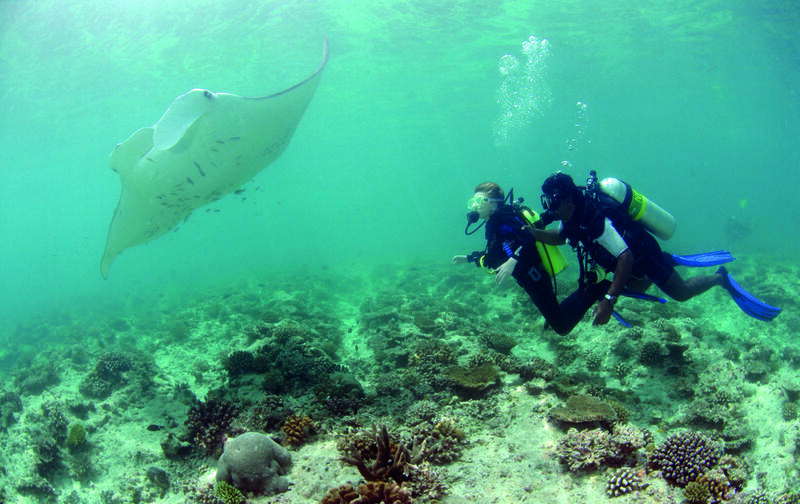 At the Bandos dive centre, a list of dive sites informs divers about the topography, depth and the levels of experience required for participation. We looked at these with Zac, choosing sites that fell within his depth range of 12m. One of those sites was Rasfari Corner, a known manta ray cleaning station. And so, on his eighth logged dive, Zac had some fabulous encounters with the mantas. He was also able to experience drift diving for the first time, at a site called Feydhoo Caves. It makes for an interesting yet straightforward wall and drift dive. He saw moray eels and lobster peering from their lairs, and ledges that harboured resting turtles. Having once dived the Epcot Centre’s aquarium in Florida, we thought it might be fun for Zac to try a similar experience here in the UK. We soon discovered that ‘aquarium dives’ were offered by the Blue Planet Aquarium at Ellesmere Port, and that they accepted kids with dive qualifications. The dive itself is a bit different in that divers are heavily overweighted and not given fins, so you effectively walk on the bottom while sharks and rays swim above and around you. Quoting the Finding Nemo film, we said ‘Welcome to Tankhood’. 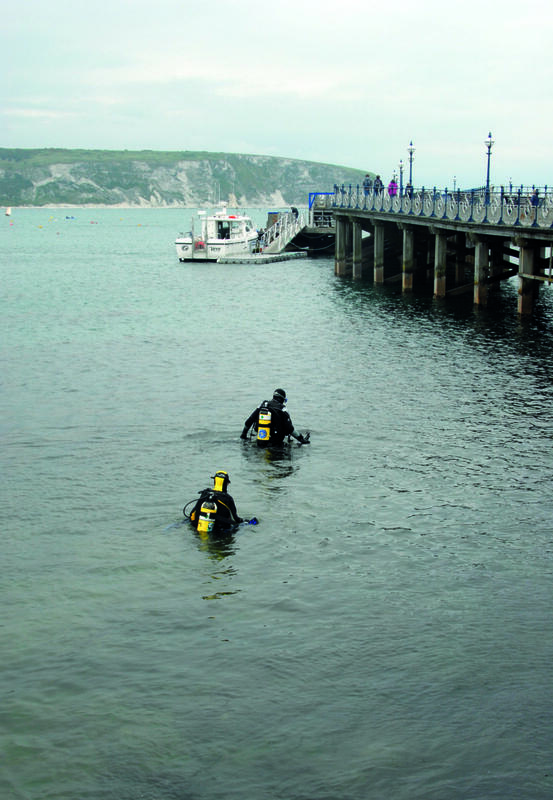 I chose the shallow and current-free Swanage Pier site in Dorset as Zac’s introduction to good old UK diving. On the evening before, the visibility looked really good, but as is often the way in the UK, it changed for the worse overnight. We thus experienced two murky water dives. On our second dive, when I stopped to look at something, Zac kept swimming and within seconds we were separated. It was a good lesson for Zac (and reminder for me) about how easily this can happen. He actually surfaced away from the pier and surprised himself about how easily he was disorientated. It was a good lesson learned. We’d heard good things about Roots from a couple of diving friends. It also had good online reviews and could cater for Zac (then 12 years old). 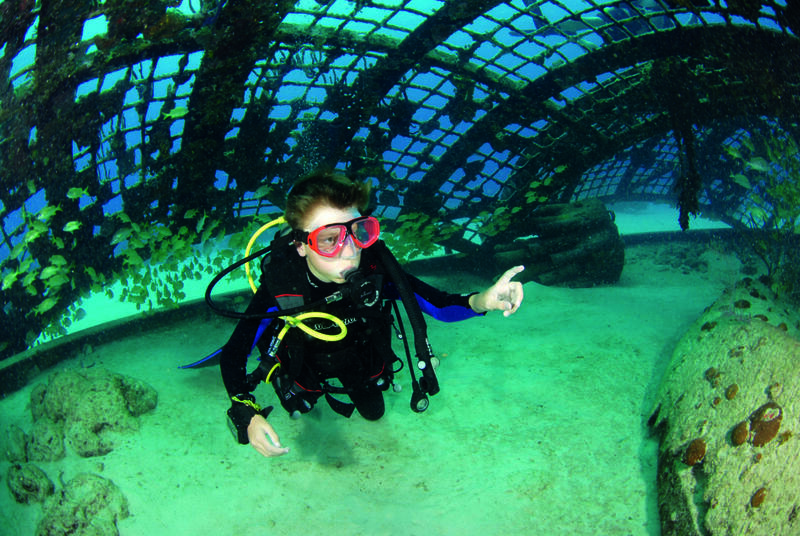 On the Roots house reef, you can head either north or south along the reef wall, though you can also check out the sloping sandy expanse in between the walls for sightings such as flounders and octopus, as well as a statue that has been sunk there for the benefit of divers – Zac was especially intrigued by this unexpected ‘find’. On Easter Sunday, the Roots team organised an Underwater Easter Egg Hunt, where four plastic eggs were placed somewhere on the house reef within the first 10m of water. Zac was super-determined to find one, the retrieval of which won a small prize. After nearly an hour, and with no Easter egg in sight, I decided to head back to see how Amanda and Zac had fared, expecting them to be back from the dive. When they reappeared, I suspected something, as Zac’s disappointment somehow didn’t seem genuine. As they waded out, Zac suddenly held out an Easter egg. He’d been successful – and won some chocolate for his efforts! Having had great times on the Cayman and Belize Aggressors, next on our radar was their Turks and Caicos boat. Like our previous Aggressor trips, this charter was another of their ‘family weeks’, unique in that children of six years or older are welcomed onboard. 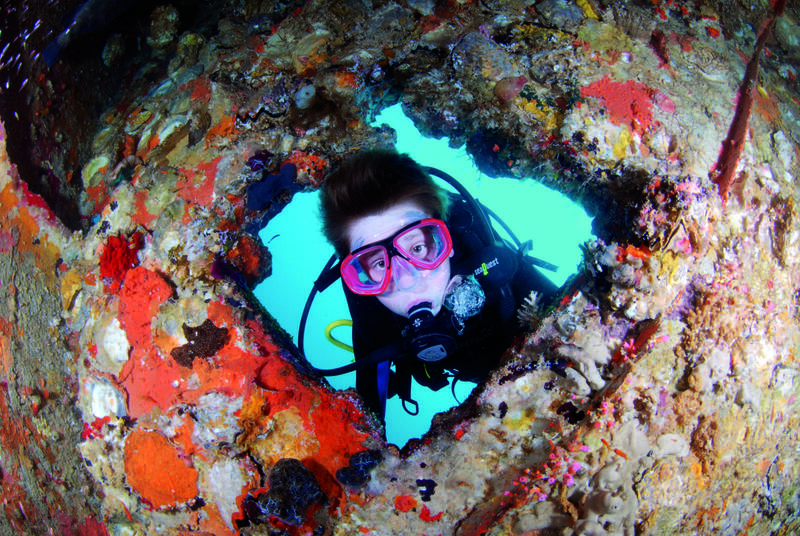 The difference this time was that Zac (now aged 11) had achieved his PADI Junior Open Water Diver certification, so he could do some of the dives as a ‘real’ diver. Zac’s underwater competence on this trip meant that he could participate in the shark dives, which he really enjoyed, taking his GoPro to get some footage at the Rock and Roll site, as reef sharks cruised around him. My ambition to see a basking shark led me to take Zac on Charles Hood’s trip based out of Penzance in Cornwall. Though it’s snorkelling rather than diving, Zac’s confidence in the water was integral in my decision to take him. Unfortunately, recent seasons have been much less reliable for sightings, but Charles had a Plan B if no sharks were encountered. 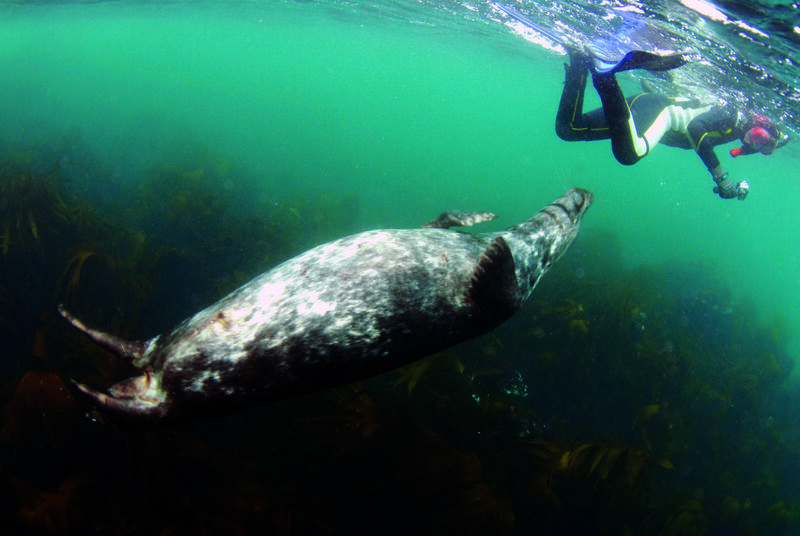 Instead, we visited a seal colony just off Land’s End. The interactions were good fun. With more experience under his weightbelt, we considered Zac ready to tackle the PADI Junior Advanced Open Water Diver course. 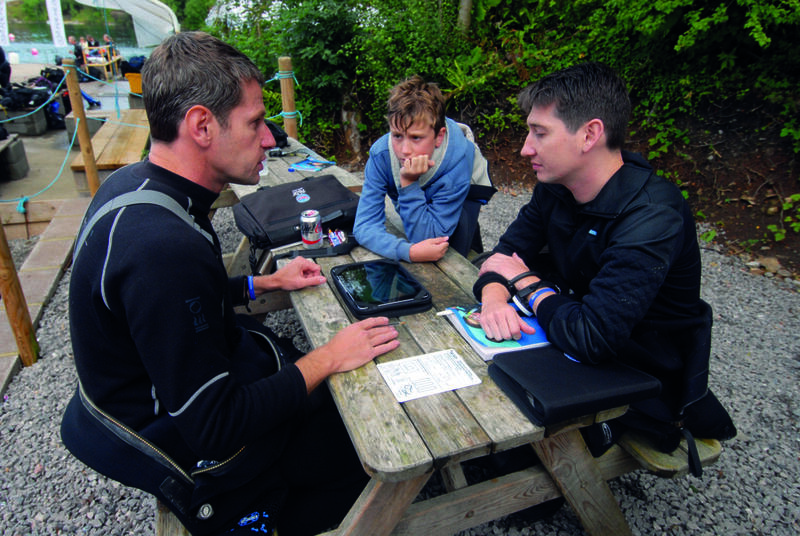 As with his PADI Open Water, Zac completed the level at Vobster Quay in the Mendips. He was thoroughly tested for various skills, including underwater navigation and mask removal, emerging cold but happy with his new level of certification. He could now dive to 18m, which would open up a world of possibilities.